Wireless speakers aren't just two a penny, manufacturers are practically paying us to take them off their hands. Some bring Wi-Fi support, others Apple AirPlay and pretty much all have Bluetooth to fall back on. The Cambridge Audio Minx Air 100 is your classic triple-threat on the connectivity front and even throws in internet radio as a tempter. The Big Jambox, along with its other Jawbone-made bezzies, has the USP of portability, and the B&W Zeppelin Air is all about that twist of debonair suave. So, what does the Marshall Stanmore offer to win your affections? Nothing. With only Bluetooth as its means of wireless playback, it sits on your shelf, all covered in leather and and brass, and flips you the finger. Like it or get out of the room. 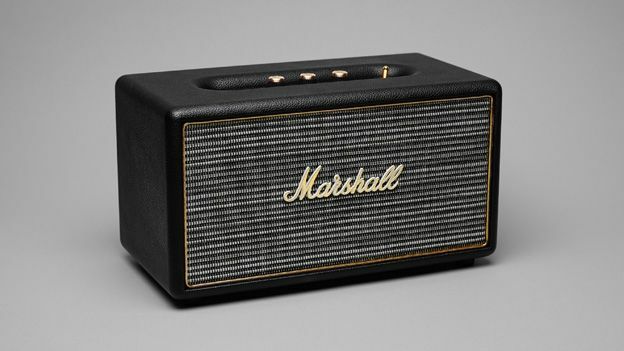 If the Marshall Stanmore were shaped like anything other than a Marshall amp, we'd be very disappointed. Even though it's a shorter, squatter version of the classic guitar blaster at 350 x 185 x 185mm, it's definitely not a portable with its 5.1kg mass and no carry handle. True to form, it's all-leather finished around the sides with a brass plate and brass controls on the top, and you end up feeling like a bit of a roadie if you ever need to hump the thing from one location to another. Nonetheless, it's a good shape with sturdy rubber feet on the bottom and looks fantastic in either cream or black. It seems to fit every household space and you're unlikely to accidentally break it. To say that the features on the Marshall Stanmore are few is something of an understatement. You plug it in, you choose your source and you start cracking the chords - someone else's chords, that is; there's no guitar input. In fact, the only feature of note is the Powersaver switch on the rear. If activated, then your Stanmore will snooze off for a kip after 20 mins or so of inactivity. You'll need to press the wake button on top to get it going again. When in Standard mode, a press of play on your source device is all you'd need but, obvs, you're killing the planet for the privilege. We hope you're proud of yourself. Ultimately, we found that Powersaver mode worked just fine once we'd found a semi-permanent home for the Stanmore in our AV pile. (We'd say 'AV stack' but this Marshall's not that much of a joiner owing to its shape.) Otherwise, if you've got it as a standalone wireless speaker, then just using the on/off switch makes most sense. If there are few features with the Marshall Stanmore, that's because the controls and connections are those features themselves. That fact that they're all fully mechanical and made of Marshall brass is what makes them all so special. We could flick the thing on and off all day, frankly. LED lights on the top tell you which source has been selected and there are a pair of giant knobs for the bass and treble which, predictably, but sadly, only go as far as 10. As we said, the wireless method of getting your tunes from A to B is strictly Bluetooth with a pairing process that's simple enough. The Stanmore does have a couple of decent hard-line connections tricks up its sleeve, though. The first is a 3.5mm jack. Now that may sound standard, but not only is it right on top rather than tucked away on the rear, but even better, you get a Marshall-style, gold-plated, coil chord, 3.5mm-to-3.5mm cable included that simply looks and acts the business. What's more there's also optical and RCA sockets if you'd like to hook this box up direct to either a media streamer or a CD separate. In reality, we ended up using it as a speaker for our TV viewing as much as anything else. For £400, you've got to be hoping for some decent sound and that's just about what this beast serves up. The pair of 3/4-inch dome tweeters and 5 1/4-inch ported woofer beat out 80W of sound which is very easily enough to blast the walls of any reasonable residential room a further two metres back from where they started. We found it best to pump our mobile source all the way up and do the rest with the Stanmore knobs. You never get so much as a hint of distortion and it doesn't want for balance at any point in the spectrum. The trouble is that its power isn't quite matched by its class. Everything is clear enough, but there's definitely an absence of punch and detail that you will get at this price with other speakers whose manufacturers have not blown so much money into the design or materials. There's wireless speakers with more advanced connectivity, more features and even one or two that sound better as well, but we'd wager that there are none that either look as good or are such a pleasure to own and use. So, is the Marshall Stanmore worth buying? Yes, it's solid, it's flexible, it works nicely with your other AV kit and you're not going to need to worry about it at all. What's more, it'll make you proud to be British just to see it in your home.